BSU football won’t get to experience the magic of Illinois State. When the Illinois State contract was signed a few years ago, the fanbase gave a collective head scratch when it was announced that BSU would be making a trip to Illinois State in 2014. I was on the “This is crazy” bandwagon when I thought about the Cards letting an FCS team play host. That simply doesn’t happen. Call it FBS elitism, call it entitlement, call it whatever you want. As of this afternoon, you can call it a non-issue. In an effort to even the 2014 home football schedule at six home and six away contests, Ball State has announced it will not compete in the second year of the contracted game at Illinois State. The Cardinals and Redbirds have come to an agreement on a buyout of the game and Ball State will pursue a home opponent for 2014. Ball State is scheduled to play at Iowa and at Army in 2014 with a home game vs. Colgate. 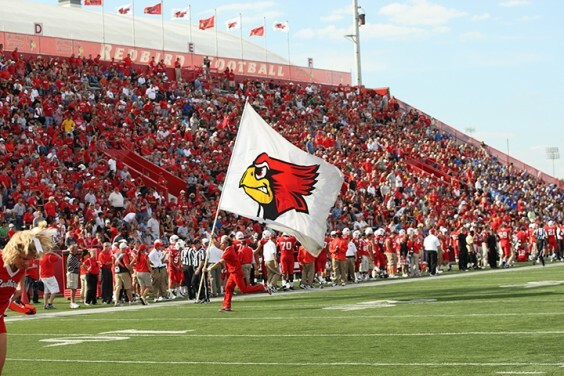 With the six Mid-American Conference games – four at home and four on the road – the Cardinals are seeking a non-conference home game in 2014. Hallelujah. I’m all for testing a team on the road as contests against Michigan, Nebraska, and Purdue in prior years set the experience needed to succeed in 2008. But taking on an FCS team at their place does nothing. Zero. Zilch. It is a true no-win situation for BSU as a win is met with a resounding, “They’re FCS. You’re supposed to beat them” and a loss is a sky falling disaster of epic proportions. I’m sure financially the Cardinals will lose money as they have to pay an opponent to come to Muncie on top of paying Illinois State to not, but maybe the Cards get lucky and schedule a home and home with a lower tier BCS conference school or other non-AQ conference school. Personally I’d love for it to be Kentucky, but SEC teams only schedule MAC teams for pay day bludgeonings, not home and homes. A guy can dream though.